Not only is Facebook a great tool for promoting your business and attracting new clients, but Facebook groups in particular allow you to interact directly with your target audience using a platform that they're likely on all the time already. Why do you need a Facebook group? First, Facebook groups allow you to nurture your audience. You build tremendous authority by being the leader of your group. Potential clients will have the opportunity to get to know and like you, before deciding to sign up for your services. Second, Facebook groups are great for building a community of individuals working toward the same goals. This is great for your business, but it’s also a value-added service for your clients. Not only do they get a killer fitness programme, but they’re also able to share their experiences with other clients. This sense of community will keep keep them motivated and committed to the programme. Working alongside other people increases accountability and makes the whole experience a lot more enjoyable! 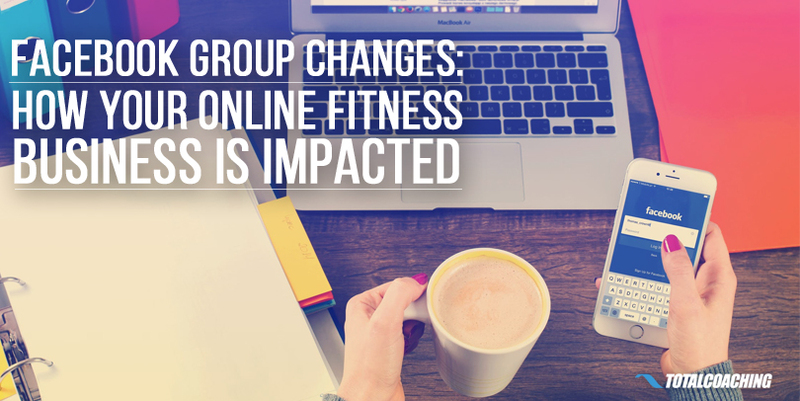 Third, Facebook groups help to reduce your work load as a coach. For example, if a group members posts a question, chances are someone else in the group will take the opportunity to respond. This takes some of the pressure off you so you can focus more on the business side of your services. What’s the best way to get members into my Facebook group? Well, before we get to that, let's take a look at what NOT to do. This is very important because far too many coaches make these mistakes and absolutely kill their Facebook group without knowing it. While it’s true that people have been using these techniques for years, they’re definitely not the most effective. No one wants to be spammed with requests to join a group they know nothing about. If people don’t know why they’re being invited to a random group, there’s a pretty low chance that they will want to join, or even if they do join, it’s unlikely that they’ll want to participate in the community. And remember, that's your goal - you are building a community, not just a group with as many members as possible. So how should you get people into your group? Even more spammy than the two methods we just looked it, Facebook used to allow people to be added to a group by a friend who thought they might be interested in the topic. Imagine that - without giving your consent, you could instantly be added to any group by any member of that group! Thankfully, with the new Facebook changes, when people are invited to a group, they can accept or decline the invitation. To do this, Facebook has added an “Invited” Section to groups. People who've been added to your group, but have never visited it, will appear in the new "Invited" section of your Members list. Invited people will not be considered a member until they ACCEPT their invite. Only admins and moderators can view the "Invited" section. 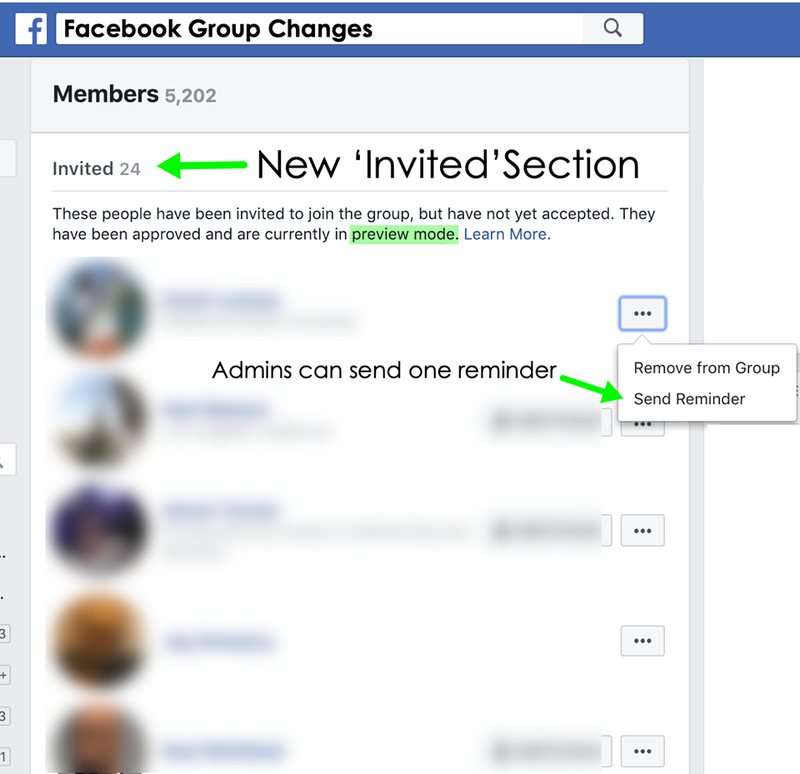 In the next few weeks, Facebook also says that admins will be able to send a notification to persons on the "Invited" list, to remind them to accept or decline the invite to your group. 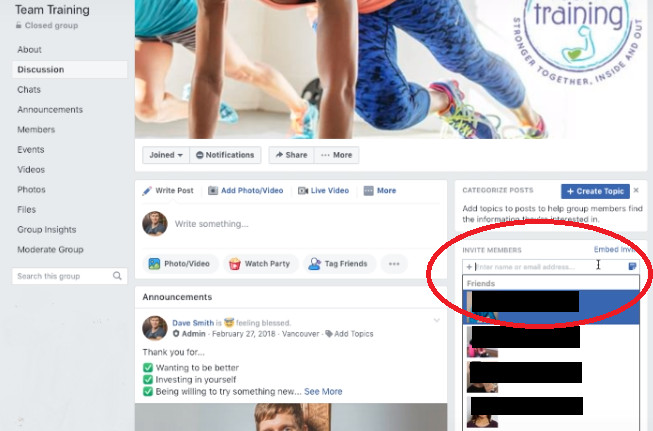 So How DO You Get People to Join Your Facebook Group? DO send a personalized message to people in your target audience who you think need and would genuinely be interested in your services. Hey Dave, I just started a new Facebook group for marathon runners. There are some really great conversations happening in there that I thought would be helpful to your training. Would you like to join in? Once you’ve started to build a relationship, and they’ve expressed interest in joining, you can send the URL for your group so they can join on their own. 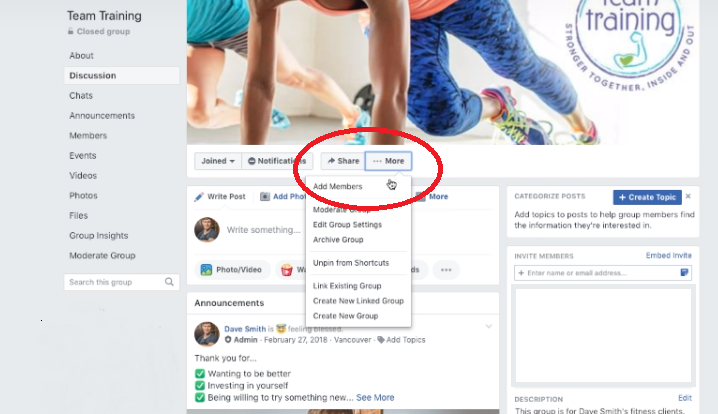 This works well with the new Facebook "Invited" section, since your audience will be making the choice to join your group, rather than feeling forced into it. And if they forget to accept your invite, you can always send a reminder using the new Facebook group features. As you can surely imagine, people who join this way will be much more likely to participate in discussions and tune into your content. This will turn your Facebook group into a client-nurturing machine! Have other questions about managing your Facebook group? Leave them in the comment box below.